Welcome to Hacienda Micro-Endodontics! You have been referred to us because your dentist feels that you require the expertise of a root canal specialist. We strive to achieve excellence through compassion and innovation. We offer comfortable and high-quality care that will help keep your natural teeth for a lifetime. We are part of your dental team. 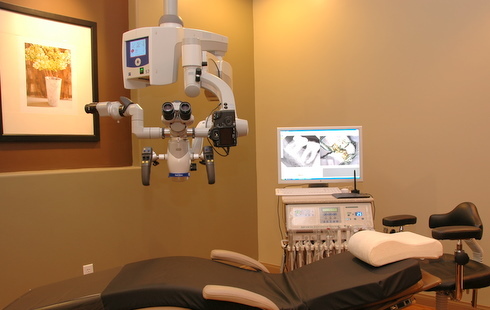 At Hacienda Micro-Endodontics, we strive to continually elevate the standard of quality in endodontic care by utilizing the most advanced technology available. Our office is a state-of-the-art Paperless Digital Office. All patient records, radiographs and images are stored digitally in a secured server. We also offer Online Check-in/Register at our website, so you can fill out all the necessary information at the comfort of your home prior to your first visit. Cutting edge endodontic therapy is delivered entirely under the Surgical Operating Microscope with optimally enhanced visualization and illumination of complex root canal anatomy, allowing us to deliver the highest quality care and the most predictable outcomes for you. Our office is equipped with a 3D CBCT (Cone Beam Computed Tomography) machine, J.Morita Veraviewepocs 3D R100, which gives more detailed image and higher resolution of the anatomy and surrounding areas when compared to the conventional 2D dental radiograph. It can also target to a very focused field to limit the amount of radiation. With such powerful imaging advancement, we are able to perform treatment through a much smaller hole than previously possible, preserving the critically important tooth structure. We also use Digital Radiography and Digital Photography to effectively document and communicate with you and your dentists. We understand that you may be highly anxious about having endodontic therapy. For the very phobic and anxious adult patients, you may be presented with an option to have Oral Conscious Sedation for your endodontic therapy. An IV Sedation can also be arranged with our dental anesthesiologist after initial consultation visit. From the design and color of our office, to the Tempur-Pedic dental overlay and neck pillow, we go to great lengths to make your visit as stress-free and as comfortable as possible. It is not unusual for our patients to fall asleep during the treatment, or even during surgery, and we take that as a compliment. Our office is conveniently located in Hacienda Heights. We have been serving patients from neighboring Anaheim, Alhambra, Arcadia, Azusa, Baldwin Park, Buena Park, Brea, Chino, Chino Hills, Corona, Covina, Diamond Bar, Downey, El Monte, Fullerton, Glendora, Hacienda Heights, Irvine, City of Industry, La Habra, La Mirada, La Puente, Los Angeles, Montebello, Monterey Park, Orange, Ontario, Pasadena, Pico Rivera, Pomona, Rosemead, Rancho Cucamonga, Rowland Heights, Riverside, San Dimas, San Gabriel, San Marino, Santa Ana, Temple City, Tustin, Walnut, Whittier since 2009. This is the most comfortable I have ever been in a Dental procedure. Mary has the hands of an Angel. The atmosphere was more like being at SPA than a dental office. The music is calming, there seems to be scented candles burning and they even whisper while operating. It was so calming that I fell asleep several times. I really enjoyed the whole experience. Mary and her staff are amazing. - Roger B.
I can honestly say from the bottom of my heart that Dr. Chien is one of the greatest Endodontist Dentists I've ever encountered. She's not only extremely professional, but she's also so kind and loving towards her patients and staff. She's so passionate about her work and it really shows! Like many, I am really scared of the dentist, but she made sure over and over that I didn't feel any pain during my visit and her, and her entire staff did such outstanding job checking on me and making sure I felt comfortable and at ease. They all also, made sure I was relaxed and well taken care of the entire time during my visit. She's so amazing in her work and she makes sure you understand and are aware of what she's doing throughout the entire process. I cannot express enough how unreal and amazing all that is! I would recommend Dr. Chien 1000% to anyone!! If you're looking for one of the best Endodontist Dentists with the top best dental care work, little to no pain, professional and outstanding customer care, then you NEED to go to Dr. Chien's office!! You won't regret it at all!! GO and see for yourself what an amazingly talented, gentle, and caring doctor she is, with some of the most kind hearted and hardworking staff by her side that all work together in truly helping their patients! Extremely grateful and thankful to all the work she did for me! You'll be too! :) - Becky O.
Dr and her staff were very warm and professional before, during and after my treatment. Dr explained and answered all of my questions and walked me through the procedures. A very warm and caring person. It was never a rush to get things done, it was if I was the most important person and it was appreciated. Her personal follow up care was also appreciated as it showed her personal concern for me. Very happy with her and her staff.....10 out of 10. Thank you Dr Chien. - Peter G.
Totally impressed with the professionalism and service that Dr. Chien and staff provided. The procedure was painless and I caught myself dozing off a couple of times. I would highly recommend dental procedures at this office. - Dell A.